In these last days, we are waiting for a huge event by the extraordinary work of the Holy Spirit, which is the third Pentecost. This third Pentecost will certainly be more extraordinary than the first and second ones. The first Pentecost was the experience of the disciples after Jesus ascended into heaven. They gathered in the upper room while waiting for what God was going to do. The Holy Spirit was poured out. Disciples, under the anointing, preached the Gospel which led to 70% of the world’s population to come to know Jesus. The second Pentecost was related to God’s visitation in Kansas City in 1901, Wales in 1904 and Azusa Street in 1906. Churches that were drifting away rose up again such that 30% of the world’s population came to know Jesus. Out of this 30%, 70% came to know Jesus through the second Pentecost. What did the disciples do while waiting for the first and second outpouring of the Holy Spirit? There were similarities: a few servants of God gathered and persevered in one accord in prayer. Acts 1:14: they were in unity. When men and women, husband and wife are in unity, extraordinary breakthrough will happen. Unity in God is the key to experience the glory of God. Unity in one big community has to start from a small community which is the family. This is because family is the smallest unit of society, and the core of the family is the husband and wife. Unity must exist between husband and wife, then later between parents and children. Husbands and wives who are not in unity will normally face difficulty uniting with their children. Why we do often face difficulties in attaining unity? The word of God states: “giving thanks always for all things to God the Father in the name of our Lord Jesus Christ.“ (Ephesians 5:20) Giving thanks is God’s com- mandment. However, why is it difficult for families to give thanks? Why do husbands rarely give thanks? It is because husbands focus on the weaknesses of their wives. Likewise, wives focus on the weaknesses of the husbands instead of their respective strengths. There are also many parents who complain about their children that God has given them, because they focus mostly on the weaknesses in their children. Each child has tremendous potential that God has given. Husbands, wives, parents, children, let us begin today by giving thanks for all the good things of God that are in each individual of the family. The husband, as a priest, should be more grateful to his wife because, behind his success, there are at least two women who play an important role: the mother who has given birth to him and the wife who has been a helper, companion and comforter for her husband and children. The presence of Eve has made Adam more complete. A man reaches his full potential in a marriage through a wife who carries out her role well. The wife begins to be grateful for the husband God has given too. Think for a mo- ment and with a clear conscience, remember again why you married your husband. There must have been some things you liked in the past which made you marry him. However, after being married for some time, these virtues have been forgotten or buried by certain disappointing events. Right now, try to jot down at least 5 good points of your husband and be thankful for them. After writing those five points, reflect on them. The more time you spend reflecting on the virtues of your spouse, the easier it will be to give thanks. For each couple, be grateful for the children God given you to care for. Every child has a different character and potential. Every parent is considered successful if he can lead his children to fulfill God’s plan in each of their lives. Therefore, each parent should pray and do their best to see God’s plan being fulfilled in the lives of their chil- dren. If the plan of God is fulfilled in the life of the child, then it is a wonderful blessing in the lives of the parents, not because the child has achieved an academic degree or is fully equipped, but that the child has fulfilled the plan of God. The Word of God states: “…submitting to one another in the fear of God.” (Ephe- sians 5:21) Arrogance, a tendency to look down on others, considering himself more superior than others. On the other hand, no one likes to be belittled or demeaned. A humble person is easily identified by his forgiving nature and not wanting to hold on to disappointments or grudges in the event of a conflict or difference of opinion. The proud person finds it hard to forgive and prefers to hold on to grudges in his heart, not just for months but at times, for years. Evaluate those within your family. Who are the more humble or more spiritual among them? The method is as follows. In a family, disagreements can occur which can lead to conflict. E.g., if conflict occurs between husband and wife, who is the one who normally initiates a conversation again when there is no communication after a certain period of time? Husband or wife? The Word of God states that, “For whoever exalts himself will be humbled, and he who humbles himself will be exalted.” If the husband always initiates the conversation, or assist in building the bridge of communication again, it implies that husband is more humble. Or is it the wife who does it more often? It means the wife is more humble. A marriage that is mutually demanding will drain the relationship between husband and wife. On the other hand, a marriage that is based on an attitude of serving and wanting to bring happiness to your spouses will bring intimacy and romance. Therefore, let’s not demand that our spouse be the first to start but begin with yourself. Race to build communication again when conflict oc- curs in a marriage. “Again I say to you that if two of you agree on earth concerning anything that they ask, it will be done for them by My Father in heaven.” (Matthew 18:19) There is a promise of God for those who are in agreement, in unity, in one heart, in one accord. In Greek, the word ‘in agreement’ is sumphoneo, where we now get the word symphony. A symphony means a group of musicians play a variety of different instruments in the same key so that beautiful harmonious sounds are heard. In this world, which two individuals can be in agreement the most? No one else except a husband and his wife. When they are united in God as well as in unity with their children, God promises that He will answer their prayer. Agreement and unity that has been nurtured in the family will make it easier for there to be unity in the church. It is because the church is made up of families. Are there any prayers which God has not answered? If there is, examine your heart. Have you agreed as husband and wife, with colleagues and business partners, with your college friends, etc? For where two or three are gathered together in My name, I am there in the midst of them.” (Matthew 18:20) God is present among those who gather in unity. The presence of God makes the house cheerful and joyful. The atmosphere of heaven is in the family. The beauty and happiness of a family is not dictated by a facility or material things. An abundance of material things or a nice house without the presence of God will be hollow and meaningless. Conversely, the presence of God in a simple facility will make a lovely atmosphere, a gift from God that the whole family can enjoy. The presence of God changes everything. Sadhu Sundar Singh said, “I would even go to the hell if I go with Jesus.” Why? He believed that the atmosphere of hell can become heaven if Jesus were there. Any problems we face: unsolvable issues, storms that comes one after another, financial problems, problematic relationship between husband and wife, etc., if Jesus is present, His presence can change the atmosphere when we respond positively and open our hearts. God tells me that He is coming is very, very, very, very soon! If you have a heart that is similar to mine, like it or not, you will remain on guard these days. Be more earnest with God. If you are sincere, you will be the happiest person. The world will be turned upside down. More people are stressed because Satan who has come to steal, kill and destroy. Satan is the father of all lies. Many have been tricked in many ways. Let us not be tricked in that way. We may be the targets of Satan, but now we change and make Satan our target. However, to do so, we need to be earnest with God because by doing so, you will see that Satan will in fact become our target. I pray to let us all walk out as winners. Amen! 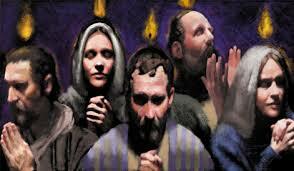 It was said they all persevered with one accord in prayer together (Acts 1:14a). Prayer can be done on our own but we are also asked to come together in one place, which is the prayer tower. There are more and more people who understand this. Now, there are more people who are from other churches come to the prayer tower at SICC on 12th floor. It is unfortunate if you have never been there before because people from other churches have come, and they felt something extraordinary. A lot of healing has taken place. SICC has become what God has said: “A House of Prayer for All Nations, a Place of Transformation for Indonesia and All Nations, A Healing and Miracle Centre.” Most people who came have said, “We will come again. We will come again to that place to bring fire home!” On the other hand, when I go to other places, I will bring fire to nations. Acts 1:26 reported that Matthias replaced Judas. Judas was referred to as someone who loved money. Pay close attention. Those who are earnest with God yet continue to love money, will be disciplined by God so that we will not love money anymore. Because of the importance of money or Mammon, there are 2,350 verses in the Bible on money. Parables of Jesus about money are more than parables about heaven and hell. For every 10 verses in the New Testament, one verse will mention Mammon or money. Why? There are several reasons: Money is the main enemy of God. If money is not the main enemy of God, God will not say, “No one can serve two masters. You cannot serve God and mammon! You have to choose..” (Matthew 6:24, Luke 16:13). At times, we do not know if we are devoted to God or to Mammon. If God does not point it out, we will not understand, what more the rich people. I have always prayed, “God, bless Your Children…”, because God has promised that, “Thief comes to steal, kill and destroy, but I come so that they (you and I) have life and life abundantly.” God’s promise for us is for abundance in all things while we are still in this world. Are rich people mostly arrogant? Yes, that includes me! How do we not become arrogant? By being processed! For man it is impossible, but with God, nothing is impossible. Hence, the way is to be processed! Is it easy for us if we have a lot of money and solely depend on God and not depend on our own riches? Not easy! It is not easy for rich people to depend solely on God and not riches. However, it is possible for man to depend only on God and that is through being processed! Without being processed, it will not be possible. The Word of God said, “Love your enemies, bless those who curse you. Whoever slaps you on your right cheek, turn the other to him also.” Is it easy for a man who owns millions of dollars to love others who have done wrong to him? Will it not be easier for him to ask someone he has hired to avenge the mistake that person has done? Thus, what are the ways so that we can do good deeds? The way is through being processed! In the dictionary, the word ‘virtue’ is defined as ‘benevolent service’, which is to give to the poor and needy. This may be a little easier but comes with certain understanding. Many people donate to the poor, at times are being filmed on TV with the instruction to broadcast their deeds later on. There are many such cases but to give sincerely from the heart is not easy. In order to be like that, being processed is necessary! Sometimes, there are rich people who own millions of dollars but hold tightly to one cent. It is not easy to be generous. The more money people have, the more difficult it is to give. They begin to be calculative on their tithe. Jesus once mentioned a poor widow He saw who gave two copper coins without thinking, simply because she had no money. She hung her head low as she placed her offering to the offering box, making the sound “…krincing..” Meanwhile, the rich man gave a huge offering and placed it in the offering box until a loud sound was heard, “bummm..!” Nonetheless, Jesus said that the widow has given much more than what the rich man had given because she gave all she had. While I was processed 5 to 6 months ago, I was weakened by God in order to be lifted to a higher place. Now that it has been completed, I am lifted to higher level together with God with new wings, new beak and new claws. For example, I notice that when I am preparing a sermon on fifteen steps about a certain matter, I need to only communicate one step at time and God will stop me. I do not need to preach on all the steps, and you will not know that there are actually fifteen steps. If one step is enough and we are all blessed, it is enough. It can probably be continued again next time. If it has to be like the previous case where all steps need to be preached on, it is better to be a lecturer and write books. Now I know that the most important thing is to have our needs answered so that you can go back feeling renewed and be changed. For example, if I go through all the fifteen steps, it does not necessarily change you and make you follow all the steps which I have preached on. Now I understand that better. The most important thing is your needs are met so that you can change! If you are aware but do not change, I am sad and God is sad too. Later on, when I am asked by God, “What did you preach on? I asked you to stop but you continued on! The proof is everyone becomes bored and sleepy!” What initially can be remembered for a month, now when they step out of the worship place and are asked, “What was the sermon about?” Eventually, the answer will be, “I am not sure..I am confused and sleepy. I woke up only because of the worship songs earlier on. Now I want to ask you, are you all blessed? Amen!